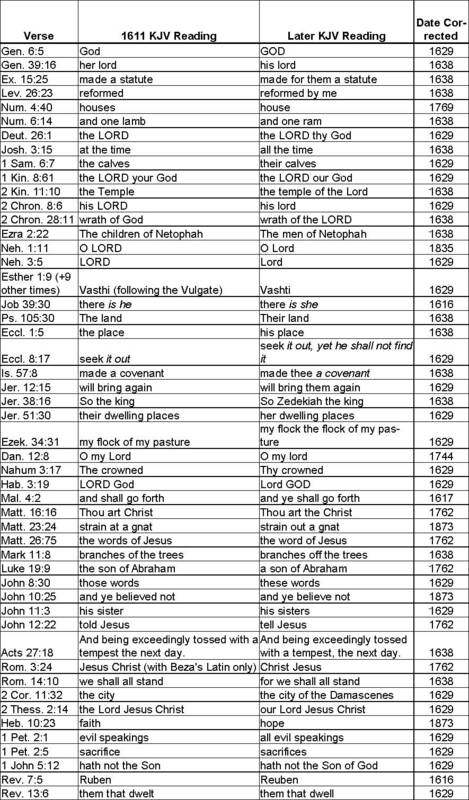 Variations of the King James Bible – King James Only? For more info on the variations between different King James Bibles, click here. Click the below chart to expand (you may have to then click it again to fully expand it). Regarding the TABLE OF VARIATIONS. The difference at Hebrews 10:23 cannot count. Many of the differences dated to 1638 or prior are clearly typographical errors which occurred in the first printing of 1611. On reason is that since annotated copies of the Bishops’ Bible was used, some problems can be identified directly related to this. Others seem to result from the usual kinds of copyist errors described by textual critics. On the simplest level, it is easy enough to explain how a single letter could have been omitted or wrongly printed in 1611. It is just as simple to explain the simplest of copyist blunders like omission of words too. The point is that these were detected and corrected. Many changes made in 1762 and 1769 (not shown in the above table) are actually standardisations of the English language. Many of the differences dated to 1638 or prior are clearly typographical errors which occurred in the first printing of 1611. One reason is that since annotated copies of the Bishops’ Bible was used, some problems can be identified directly related to this. Others seem to result from the usual kinds of copyist errors described by textual critics. In reading and hearing the debate about the KJV superiority over later and contemporary translations by opponents and proponents, I must say that the main defense for KJVers seems not to be from a convincing argument for sound scholarship but an unswerving tenacity to the assumption that it is an inspired translation and therefore any basis in scholarship is either moot or unassailable. Nor do they receive reports of proven defects of the translation very well.